tell us a little bit about you… Hi there! My name is EE and I am twenty-something-at-heart wife, auntie, wanna-be photographer, world traveler and yogi. 3 things you cannot live without everyday? 3 things that I can’t live without (exclusive of the people I love, of course!) are 1) morning cup (or 3) of coffee (one mantra I live by: no coffee no prana), 2) yoga mat and 3) iPhone, of course! what is your approach to project life? 2014 is my is 4th year of approaching Project Life weekly. I love the immediacy of documenting our memories both big and small. Even though we don’t have kiddos, I still think we lead a life worth remembering. Doing Project Life actually makes me happy and remind myself that we are lucky to have the life we lead. what is your project life process? I try to keep up with my album on a weekly to biweekly basis, although I am currently almost a month behind (sometimes living is more important than documenting). I don’t have a specific method to my madness. 90% of my photos are taken with my iPhone and many of those edited with PicTapGo and Instagrammed. I use DropBox to upload photos from phone to computer (which is one reason I rarely use my Nikon dSLR anymore - too lazy to have to hook it up to upload photos!). what is important for you to include in your pages? Our Project Life is pretty much our life: the everyday, rituals and routines, big events, and travels. This year I have been including older photos that relate to current events (like birthdays or Mother’s day or wedding anniversaries), more depth in writing and lots of white space in design (which is why I love Tracy’s style so much). do you have any “must have” tools for project life? My “must have” Project Life tools: core kits (I toyed with the idea of going digital to save space but I love feeling paper on my hands), aforementioned iPhone, PicTapGo app, my Mac, Photoshop Elements and Tracy’s Simply White collection to include lots of photos on a page with a clean look. tell us a little bit about you… Hello. My name is Sherry Stone. I've been married to Rob for 20 years and we have 3 children ages 9, 12 and 16. I'm also a RN working part-time. Kentucky is home…and if you have never been to the beautiful state of Kentucky, you should. You can find me on Instagram at Stonefamily5. 3 things you cannot live without everyday? Coffee with cream (preferably Hazelnut) & Diet Coke with lots of ice. Technically that is 2 but Icould just categorize it as "drinks"…right? Laughter; it truly is the best medicine and such a gift to give yourself and others. what is your approach to project life? Since I was a little girl I have always loved photographs thanks to my grandmother Leona. She kept old shoe boxes full of photographs, each with handwritten dates, names and places on them (sometimes on the front... yes, I know). I have so many memories of her pulling those boxes out and us sitting at the kitchen table for hours looking at them. They were like treasure boxes to me (and my grandmother). I loved the stories she shared. I loved the range of emotions that went along with the photos when we would look at them. I loved every little aspect of her box of photographs… or nowadays as Becky would say "documenting". I loved the way my grandmother told her story and shared it with me. Likewise, I want my story and our family's story to be told and passed on. I really can't imagine living and NOT documenting. what is your project life process? This is my 5th year doing Project Life and each year I change it up to keep it fresh. What I have learned over the years is to let go of perfection…(or at least try to) and I try to keep it simple using a variety of Project Life core kits and mini kits. I'm drawn to simple but colorful. Where once I would never think of leaving a journaling card blank… I now actually like the look. I try to set aside time each Sunday afternoon to work on Project Life, but life has gotten busier and I carve out time when I can. I really don't like being any more than 3 weeks behind, but having said that I am currently about 6 weeks behind. The last couple of years I've been using a week at a glance/highlights approach. I always start with my pictures I took for the week. I have a dslr but probably 90% of my pictures are from my iPhone. I take lots of random pictures daily. I try to select the pictures I think best represents our week. I usually end up with anywhere from 5 to 10 photos that tell that particular week's story. (She's not paying me or giving me free product…but this is why I love Tracy's digital designs! ) Tracy's designs allow me to incorporate several pictures in a 4x6 on those weeks I have lots of pictures and stories to tell. I LOVE the built in text boxes! Seriously. You can pack so much story into one 4x6 and still have white space. I'm not a digital savvy girl so I don't do a lot of editing of my pictures. I do have Photoshop Elements and can do a few things…and I do mean a few… like crop, text, and using the stamp & brush tool. I love using Ali Edwards' and Cathy Zielske's stamps/brushes for adding words and designs on my pictures. As far as printing goes, I print from home on my Epson Artisan. Granted, it's not as cheap as retail printing but the convenience and quality is worth it to me. Once my pictures are printed, I pick a color that I think would look best with my pictures and then choose filler cards accordingly…. then I start the pocket shuffle. what is important for you to include in your pages? As far as pictures go, I really try to include the good, the bad and the ugly of our week; the struggles and the triumphs; the smiles and the "talk to the hand" photos. Ideally, I'd like to have an "equal" amount of photos for each of my kids. But in reality, that is not the case. If you take a look thru this year's PL book or my IG account you would think I had only 1 daughter. My boys are older and want to shy away from the camera…. and that's ok. I am working on getting myself in the story more. Man that is so hard! We're all prettier in person…right?! do you have any “must have” tools for project life? iPhone. iPhone and Project Life = The dynamic duo in memory keeping as far as I'm concerned. I also love the Collect Photo app for keeping me chronologically organized. i am so excited to share a brand new blog series called creative inspiration. 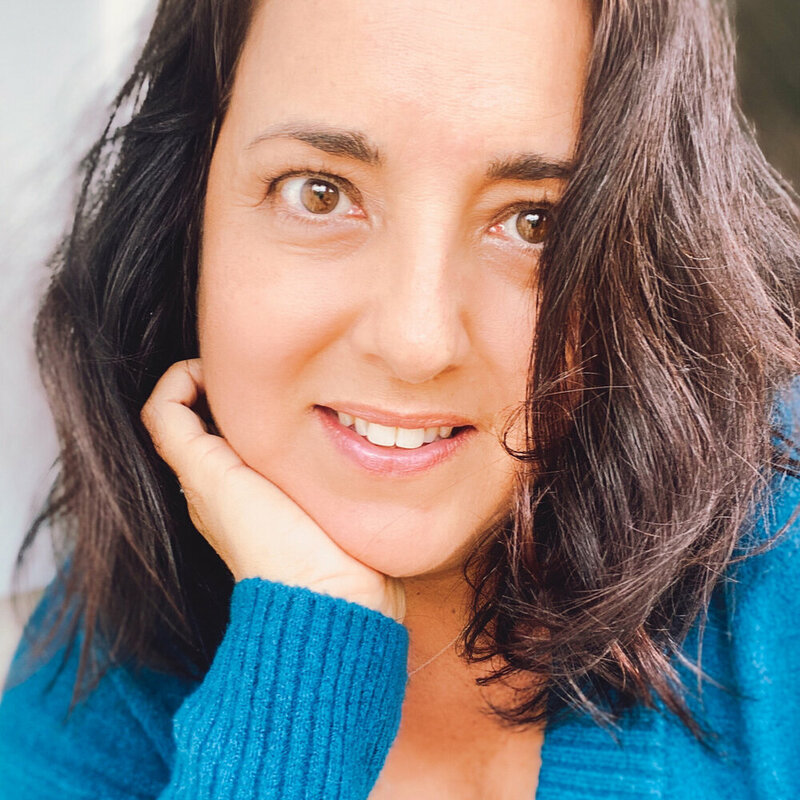 i will be featuring some talented ladies who are sharing how they use my digital products to document life in their own unique way. tell us a little bit about you... Hi there! My name is Shari Barnes. I am a wife to my amazing husband, Eric. I am also the mother to three children who I adore more than words. We have Logan (17), Noah (14) and Kendall (11). I am a "retired" photographer who now proudly stays home to raise our children. However, I am not one to just sit around so I am constantly working on different projects all the time. I currently run a food blog called Shari Blogs. We currently live in Tennessee, but have lived in several different places so far in our 21 years of marriage. 3 things you cannot live without everyday? Love from my three kiddos and husband, my phone, and something yummy to eat! what is your approach to project life? One day I finally decided to give it a try at the insistence of my friend Shawn. I fell in love with it. I liked how it made all of my random images throughout the week come together so beautifully into one layout. 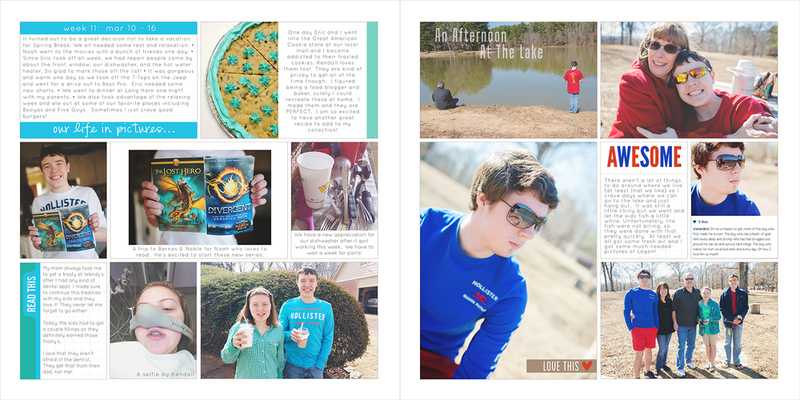 (Before, I had been more a traditional scrapbooker where I felt like I had to have the same theme photos on every layout.) I was now motivated more than ever to capture those little everyday things that I wanted documented in our life stories. Scrapbooking has been a part of my life since my oldest son was born 17 years ago. However, Project Life is so much faster and just fits my lifestyle so much better. I can easily find time to do it each week. It feeds my need to be creative too. Most of all, it lets me document this life that I share with the people who I love and adore most. what is your project life process? First off, I do digital project life. It just works best for me. I love being able to change colors of journaling cards, etc to match my photos. I definitely love the no mess part of it too! I try to stay current on my layouts although sometimes life can get in the way of that always happening. I use weekly pages in my albums, but I have no problem with combining a couple weeks into one spread if need be. There are some weeks that I just don't have enough pictures for two complete pages so combining them works great. I use Photoshop CC to create all of my layouts. I will be sending my page files over to Shutterfly (or other book publisher) to have a book printed/created once the year is done. I just love bound photo books much more than the binder/page protector concept. It's all personal preference though. The downside, I have to wait a whole year to see my layouts in print! As for my photos, I don't set out to take a picture everyday. I just capture what I feel I want documented in our books from that week. I work much better without the pressure of feeling like I need to take a photograph every single day. do you have any “must have” tools for project life? For my phone pictures, I couldn't live without the PicTapGo app. EVERY phone picture gets processed through it. All of my pictures are taken with either my Samsung Note 3 phone or my Nikon D800 camera. I can't imagine living without either of these!! 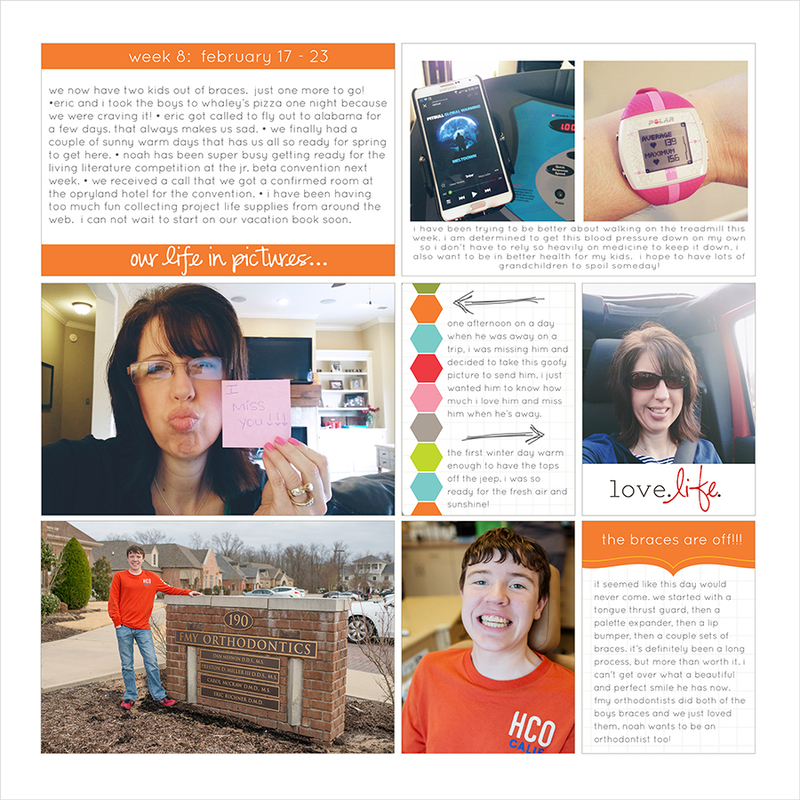 Almost all of my layouts include Tracy's Simply White Photo Templates and the Week in Review templates. I absolutely LOVE them! Of course, I have to say Photoshop CC too!